SAN FRANCISCO— The gold letters spelling out “City Lights” on the corner act as somewhat of an unassuming, arching beacon towards the front door of the bookstore in a grittier part of San Francisco’s Chinatown. For all intents and purposes, it’s just another bookstore and for most tourists and passers-by, it likely remains just that. Its shelves are stacked to the brim with old classics and new bestsellers, quirky and off-beat quotes are precariously placed above doorways and in nooks, and the clerk has a cool air about him as he slides patrons’ purchases back across the dimly lit counter. At a glance, City Lights could just be a bookstore like any other. Only, to leave City Lights as “just a bookstore” is to say that Fenway is “just a ballpark,” or that Grand Central is “just a train station,” and to call it “just a bookstore” is to miss out on the history of a revolutionary American literary movement that was spearheaded in-between these very stacks at City Lights. Inside, the remnants of City Lights’ spirited history begin to emerge. Lettering in chalk over the first doorway foretells, “Abandon all despair ye who enter here,” and in a sunken alcove, shelves upon shelves of independently published paperback literature. Beyond the San Francisco travel section an additional doorway that opens to a small hallway containing an unexplained floor mosaic from past tenants that reads, Vitalini Fotografia Italiana, and an untidily kept bulletin board covered in a rainbow of Post-It notes. Here, folks offer themselves for odd jobs and post quotes from favorite authors, and upon reading a few it seems as if the multicolored scraps and scribbles come from unshaven backpackers of the likes of young, vagabond Jack Kerouac reincarnates. The heart of the Beat movement still pulses here, and the layers of contemporary American literary history come to life in the fading black and white photographs of great writers and poets over the years lining the stairwell to the upstairs shelves of beat poetry. 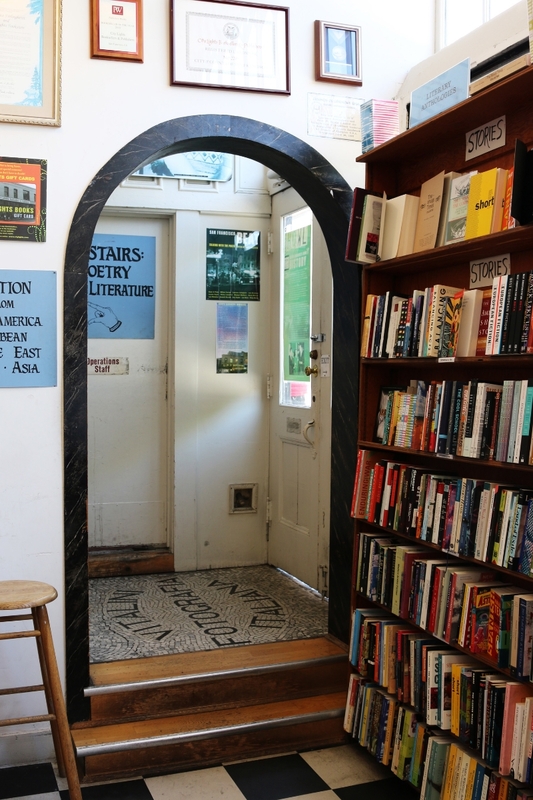 Although the books on the shelves have changed, the spirit of the independent bookstore appears to remain the same as when poet Lawrence Ferlinghetti opened its doors in 1953 with business partner Peter D. Martin. As signified in the proud way that the independently published paperbacks on anti-authority, counterculture, and gender are featured front and center, the soul of City Lights’ shines in its fierce commitment to progressive ideas, the same ones that shaped the San Francisco renaissance and the Beat movement in the 1950s. Today, City Lights remains a haven for readers, poets, and writers of all kinds, championing those who aren’t afraid to challenge censorship, authority, and general pushing of the envelope.